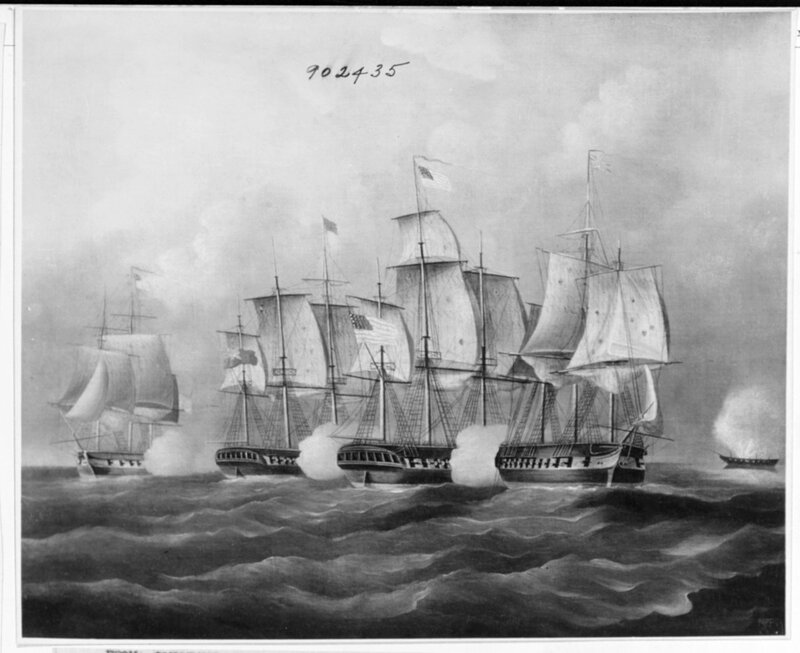 HMS Rainbow began to score with her bowchaser and followed with a series of broadsides which finally forced Hancock to strike her colors after a chase of some 39 hours. 36k Continental Frigates Hancock and Boston capturing British Frigate Fox 7 June 1777. 96k "USS HANCOCK, BOSTON and FOX vs. HMS FLORA and RAINBOW, 7 July 1777". Painting by Francis Holman, 1779 of HMS Flora (left) recaptures the American prize Fox. 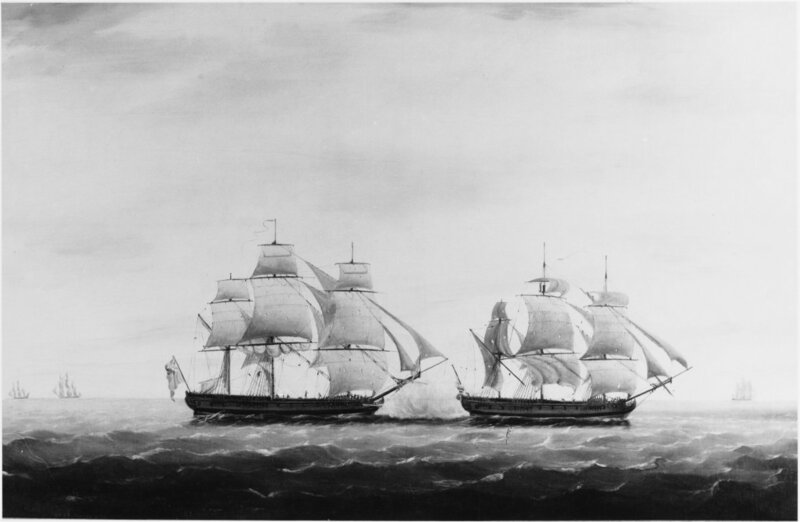 At right, the Continental Frigate Boston escapes into the distance, while at left, HMS Rainbow is in chase of the Continental Frigate Hancock, which was finally captured the following day. Fox was formerly a British frigate, which had been taken by Hancock and Boston, 7 June 1777. Commissioned by Captain Brisbane, Commanding Officer of HMS Flora. Fourth of a set of four. Description: Courtesy of Carl L. Crossman, Childs Gallery, Boston, 1971. Purchased by Peabody Museum, Salem, Massachusetts, in 1976. 166k "British and American Vessels in Action"
Painting by Thomas Buttersworth of the American frigates Boston under command of Captain Hector McNeill, and Hancock under Captain John Manley, in action against the British frigate HMS Flora and British ship HMS Rainbow, off Cape Sable, Newfoundland, 7 July 1777. 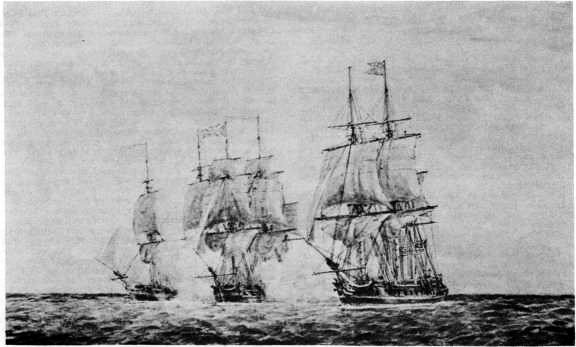 Following the action, HMS Fox was recaptured from the Americans by Flora, Hancock was captured by Rainbow after a 39 hour chase, and Boston escaped.